Charles David Obremski lived out this verse, although not from day one. Chuck was born in Pittsburgh, Pennsylvania on December 17, 1956. Other memorable dates included his marriage to Linda in 1975, their move to Orange County, California in ’76, and his graduation from California State University Fullerton with a BA in Criminal Justice. Incredibly special dates imprinted in Chuck’s memory were the birth of his and Linda’s three children and their two grandchildren. He loved kids. And Chuck Obremski, chaplain to the Anaheim Angels, also remembered the day in 2003 when the Angels players presented him with a World Series ring. But the date that was indelibly inscribed in his memory more than any other was the day that Romans 1:16 became his. On February 16, 1978, Chuck came face to face with the fact that he was a sinner and that Jesus Christ, son of God, had taken Chuck Obremski’s sins upon Himself on the cross. At a Valentine’s Day banquet that evening, Chuck’s heart was forever changed. When the power of the message of forgiveness became clear to Chuck, he surrendered his life to Jesus Christ and ran forward with the good news. He was determined to share the joyous news of Christ crucified and risen with everyone! God knew that Chuck Obremski would take His message of salvation wherever He placed him. In a Bible study at Calvary Church, Santa Ana. In a huddle with the Los Angeles Rams. In the midst of the Mighty Ducks. With the Anaheim Angels, when it was the bottom of the ninth with two outs and when they celebrated the winning of the World Series in 2002. And week after week at Kindred Community Church, where “Pastor Chuck” faithfully served and preached. 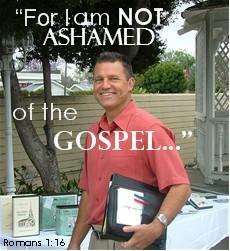 In July 2003, Chuck Obremski entered a new arena for sharing the gospel of Jesus Christ. Never one to frequent hospitals or doctors’ offices because of his aversion to “medical procedures” and because he was a healthy, fit 46-year-old who daily ran the hills in Orange near his house, Chuck was thrust into the medical realm when he discovered a lump near his groin. “Sarcoma” was the diagnosis—a soft-tissue, aggressive cancer that would eventually metastasize to his lungs and his liver and lead to his earthly demise. The doctors pronounced Chuck “a dead man” if it spread to his lungs. Many were amazed that two years after the initial diagnosis, Chuck Obremski was still in the pulpit, still holding chapels for the Angels, still smiling broadly and encouraging nurses and doctors and patients and his buddies in the sports world. When part of his lung was removed and he was discharged from the hospital on Saturday, he was in the pulpit the next morning. In a touching message, “Expecting Miracles; Accepting God’s Perfect Will,” Chuck Obremski shared of his diagnosis and his complete trust in God. Standing beside him in faith and confident trust have been his dear wife and precious companion of thirty years, Linda, along with his mother Pat and three children, Dana, Ryan and Krista. God knew that Chuck Obremski would be faithful to the end. He knew that Chuck would not waver in his faith, for Chuck was not only an avid reader of the Bible, he was a believer of it! Weekly, Chuck would throw out challenges to his congregation, while being transparent about his own struggles. He never lost an opportunity to share the good news, whether his listener was in church or in a locker room or in prison or a motorcycle gang or a hospital bed. He’d look you straight in the eye, his own intense blue eyes searching your soul, and ask you how you were doing. He cared; he shared; and he lived. Chuck Obremski’s most powerful messages came near the end. For God had allowed the “blessing” of cancer in his life, and Chuck knew that it was for a purpose. On the brink of death. Chuck Obremski began to teach and preach on heaven. He’d peer out at the congregation, his eyes alight and ask: “How many of you want to go to heaven?” Hands shot up in the air. He smiled his characteristic broad grin and followed up with: “Well, how many of you want to die to get there?” The hands shot down. He would share from the Bible the scriptures that spoke of heaven and hell. And Chuck would again speak of his favorite day— February 16, 1978—when the sting of death was removed for him. Chuck was excited about the prospect of entering the presence of his Lord and Savior. He had no fear of death, because he knew what was waiting for him on the other side. When a fellow believer would die, he’d proclaim, “They beat me to it!” And his excitement was contagious. It’s one thing to hear heaven being preached when the messenger is robust. But when 48 year-old Chuck Obremski, pared down by disease and inflicted with pain and often struggling to breathe, spoke of death not being a punishment but a reward, we listened. The promises of God, each one trustworthy and sure, were not platitudes for Chuck Obremski. He lived what he knew was true. And God’s strength sustained him to the end, filled him with joy in the midst of pain, and brought him home in glory. “Precious in the sight of the Lord is the death of His saints” (Psalm 116:15). Chuck knew that and was looking forward to it. September 18, 2005 became Chuck Obremski’s next most memorable day. “No fear of death” was his cry to the end, for he knew the one who had overcome death was bringing him home. Chuck Obremski never believed in keeping good news to himself. He wanted others to experience the same power of God for salvation that made him face death with anticipation! And an invitation it was—a clear call came from Jeff Kemp, former Rams player, to all present: a call to follow Jesus—by first accepting His death on our behalf for our sins, and then running with abandon the race set out for us. The music for the service was absolutely touching— from the beautiful praise and worship songs led by the praise team to the special duet performed by Meaghan O’ Hern and Dana Bailey and the inspiring song sung by David Garret—to the closing rendition of “I Can Only Imagine,” powerfully presented by Sylvia Cotton and Allan Cason. The video show of pictures and music brought both laughter and tears to our hearts—memories of Pastor Chuck’s life spent on behalf of all those whom he loved, whether it was his beloved Linda or mother Pat or precious children and grandchildren, or his special friends and church family. Business partner Dave Galaway spoke of Chuck’s endearing presence in his family’s life, reflecting on a friendship and a business relationship that was built on Jesus Christ. “No harsh words were ever spoken between us” and “Chuck was the brother I never had” reveal a tender heart and special bond that will not disintegrate with time. Jackie Slater, former Rams player and Kindred member, shared with us that it didn’t take him long to find out Chuck’s passion. In between moments of silent sobs (or, um, allergy attacks), Jackie spoke of taking Chuck’s challenge to use the platform given him to tell others about Christ. He recalled how his boys most appreciated “Uncle Chuck” coming to their birthday parties and praying for them. Vince Nauss, head of Baseball Chapel, pinpointed what set Chuck apart from others: “Chuck lived out the joy of the Lord.” And he shared that Chuck, just two weeks prior to his homegoing, called him and apologized: “I’m sorry I couldn’t finish out the season.” Vince underscored what we have seen firsthand in Chuck Obremski’s life: Chuck finished all that God had planned for him, and he finished well. Paul Byrd, pitcher for the Angels, also recounted a conversation with Chuck that he’ll remember. Chuck, in the full throes of the Cancer Coaster’s clutches, reached out to encourage him. Chuck never used the cancer as an excuse to stop ministering, and he never complained. Paul concluded with his trademark “O” stance—in appreciation of his friend and mentor. Tim Salmon, Angel outfielder, thanked each family member for the sacrifices they had to make to allow Chuck to minister to him and the other sports players, knowing that their sharing made a difference. “Chuck helped me see God at work in every area of my life.” And Tim committed to keeping Chuck’s legacy alive, by keeping his eyes on Jesus. Former Rams player, Jeff Kemp, put into words what many of us feel—the dichotomy of joy and grief. “I’m mixed,” Jeff shared. “I feel terrible and awesome at the same time.” He described Chuck as having a “lawyer’s mind with a blue-collar mouth”— the distinct ability to take profound insight of Scripture and make it “graspable” to the average person. And he asked us to “up the ante” as Chuck did under trial—surrendering our all to our Lord. For those who knew Chuck but didn’t know his Jesus, he asked for a surrendered heart, and he led us in prayer to that end. Son-in-law Jack Grogger, also High-school Pastor at Kindred, steered our minds in Chuck’s direction. Questions regarding Chuck’s final two years—“Why him? Why cancer? Why now?” were answered as Jack outlined the many answers to prayer through Chuck’s inevitable ride on the Cancer Coaster. Those answers led Jack to rejoice and direct us to do the same. “WOW! Look at what God has done!” That was indeed Chuck’s prayer, too. Don't you dare take your eyes off of Jesus! your post made me start humming this sweet song, " ... one look at His dear face, all sorrow will erase - so bravely run the race, 'til we see Christ ... "